Simply, identify 4 iconic destinations based on the provided images in the contest form. If needed, find an additional clue at locations specified in the contest form on Bragpacker’s portal and social media pages. 1st Prize: Selfie Drone – Loaded with an HD camera and flying upto 100m high, Wifi enabled and controlled by any smart phone, you can take spectacular videos and pictures from a bird’s eye view with this simple to use and pocket sized drone. 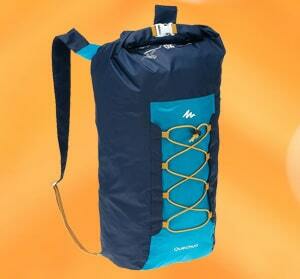 2nd Prize: Waterproof Backpack – 20L, ultra compact daypack. Winners will be selected randomly from eligible contestants (i.e those who have answered correctly and have liked our Facebook page) and will be notified on their submitted email IDs. Participants who have completed the quiz on or before 20th June, 2017 will be considered for the 1st and 2nd prize. If a Contest Winner does not respond to the email notification within 3 days or the mail bounces back, Bragpacker reserves the right to choose another winner in his/her place. No cash alternative to the prizes will be offered. The prizes and the coupon codes are non transferable. Geographical restrictions on services offered by Bragpacker.com shall apply for the prizes. Winner of the Drone shall be the owner of the drone and be fully responsible for complying with regulations in India before using the drone. Bragpacker shall in no way be liable for any non-compliance on the part of the owner. The Contest Rules shall be governed by Indian law and any disputes will be subject to Mumbai Jurisdiction.